Donnie Henry, Raconteur of Art, started a new artistic endeavor named Music To My Eyes or MTME. Donnie's studio, Hotel Regina is where ticket stubs, concert memorabilia, etc. get re-envisioned to form unique, one of a kind impactful pieces of art. Donnie reached out to PLAY to help bring the MTME brand to life with a logo, website and marketing. Because of Donnie's audience and subject matter, the MTV Generation came to mind for inspiration. Hence, a colorful grid emerged, reflecting much of the artwork itself. Each person receives multiple sets of business cards with different colors. This allows the MTME brand to feel larger and lively, having more than just one color. 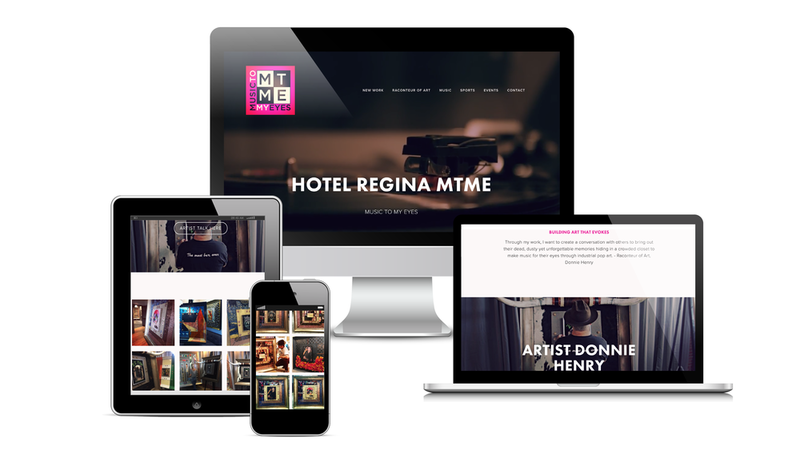 As with all sites PLAY designs, MTME is responsive so it looks great on any screen size. The home page showcases a video of a vintage record player spinning an album. This is meant to emotionally connect the user to the idea that MTME creates new art with collected material around memorable events.